Recovering Working Mom: I hold these truths to be self evident . . . I hold these truths to be self evident . . .
Life – that might be hanging by a thread if you create a scenario where mommy pulls out the old “I brought you into this world, I can take you out!" The Pursuit of Happiness – which mommy can make d@mn near impossible if you push her too far! 1) “Summer bridge” workbooks and summer incentive programs so that your kids “avoid the summer slide” were created by the same people who you tortured for 9 months as you dropped off your children at 8:30am and picked them up at 2:30pm (aka your child’s teacher). This fact should make you very suspicious of pursuing a course where you try to have your kids do these workbooks. Of course, what the reviews for these books DON’T tell you is that you had better take a class on how to do 2nd, 4th AND 6th grade math, language, grammar and science because when your kid asks you what a quadrangle, dangling participle or a preposition is, you better have a better answer than “lets see what Google says”. This picture's been used before, but it's so priceless I couldn't resist using it again. 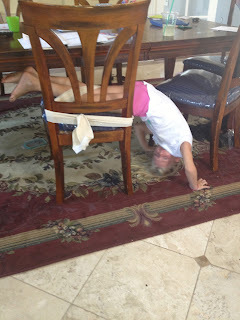 Not sure who was more tortured - the Id who was stuck in the chair, or mommy who had to enforce the punishment! And by the way, I also learned that I need to seek a refund of my undergrad and law school tuition. I am in no way suited to be alone with 2nd, 4th and 6th grade children working on summer workbooks. I won't identify which kid has what issue, but these books have been very helpful for 2 of the kids. 2) Multi-tasking should be re-named “WTF-are-you-doing-taking-your-eyes-off-the-children-when-they-are-loose-in-your-house" tasking. When I was working I somehow managed to get myself showered, dressed, children fed, lunches made, and out the door by 8am. I did this all while typing out an e-mail, answering a phone call, and signing the permission slip that wasn’t due for another week. Now, I’m lucky to get out the door with my hair brushed, and forget that shower thing . . . that’s not happening. Oh, and those permission slips – I actually average at least once where I have to ask the teacher for another copy. Last week I was lucky to be out of the house by noon, and I was lucky to have showered. The 24-7 exposure to miniature versions of myself made my brain mush. I have absolutely no idea what the children are doing with their faces, and it wasn't until I posted this photo that I realized they even did that!!! Mush, I tell you, mush!!! 3) During the summer the phrase “stay at home" mom manifests itself as “Dear God, please, can I be anywhere but home" mom; for if you are at home with your beloved children, someone (named the Id) might get strapped to a chair with an ace bandage so she can’t run away, and someone (named mommy) might find herself the spectacle of the neighborhood as she sits on her front porch and cries during her nervous breakdown! Of course, at the time mommy was not sure if she was crying because she was really upset, or if she had such bad PMS that she could no longer control herself!! Mommy can’t even bring herself to think of what it’s going to be like when there are FOUR of us suffering from PMS. We’re pretty sure mommy will have actually moved into the looney bin by then. A P.S. to the Nana who I am certain will put this in her custody file - that was an ace bandage and she was able to get out of the chair if she tried hard enough!!!! Of course, you may regret the gelato stop when the children become absolute looney tunes because of the sugar. Nonetheless, Yelp didn't lie - Pappalecco in San Diego's Little Italy was the yummiest gelato I've had since going to Italy 10 years ago! Visit the San Diego Children's Discovery Museum in Escondido. Of course, mommy didn't remember her ice cream rule from the day before . This was at Golden Spoon, which, by the way, was really good. I loved the way they did their toppings (inside the yogurt, not just on top). These strawberries were so good, they ate 2/3 of them before we even got home. One BIG CAVEAT - it's very muddy in some parts, and this is what your child's shoes can look like. Of course, this is my little tomboy the Ego (middle child)! We needed those shoes the next day for summer camp. CRAAAAAAP! And, of course, enjoy the San Diego sand and sun!! Oh yeah, and the other moral . . . send the children away to sleepaway camp, and send yourself for a southern vacation for two weeks!! Second generation campers at Geneva Glen Camp in Colorado. Mommy and Daddy at Magnolia Plantation outside Charleston - Gorgeous! And before you go, you could get a new do!